Facebook has launched a new feature to keep a safety check on its users. Before the launch, around 1.35 billion users of Facebook can update their friends and family about their activity, life events, job, location, Interests like books, clothing, etc. On last Wednesday, Naomi Gliet- VP of Product Management, Sharon Zeng – Product Manager and Peter Cottle – Software Engineer announced the launch of Safety Check feature for Facebook users to notify friends and family about their safety. The feature is introduced to channelize the communication between family and close friends in case of natural calamity. By keeping, earthquake and tsunami of 2011 in Japan as a reference, a team of Japanese Facebook engineers worked on a tool that keeps you connected with your family and friends in the disaster. According to the Facebook, the tool will be activated for the users who are believed to be in any affected area. It will automatically detect you using location via “Nearby friends” and location where you have recently logged in. 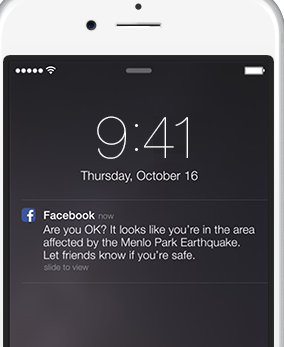 Then, a push message will be received by the user asking if you are safe, if you replied “YES”, then it will send a Facebook News Feed to friends and family. Know your friends and family that you are safe. Check who all are in the affected area. Check who mark themselves as safe. It is not the first time when a social networking site has launched some safety check feature for times of crisis. Twitter has launched Twitter Alerts to acquire crucial tweets from government agencies and notify its users using push messages. Another example, Google is using its Map Service to locate disaster relief “hotspot” during an event of a crisis.